Star Alliance member Swiss currently sells very attractive economy class flights to Bangkok in Thailand. Travelers can book these flights with departing from Zurich (Switzerland) with fares start from only €427 for a round-trip. Visit stunning Bangkok (Thailand) with it’s spectacular scenery, exotic sunsets and warm sea, friendly peoples, awesome foods, and many things awaiting you. There are various dates across May – July; September – December 2019 which we’ve listed out below, but feel free to play around with the dates yourselves in case these don’t suit! Please note: Baggage allowance is 20 kg, but may vary according to route, code share regulations, frequent flyer status and cabin class; please check the exact baggage regulations printed on your ticket. To get the flight deal you can use this flight search box, just enter the travel dates, departure city, destination like above and select the flight class, we will find the cheapest flights for you. Of cause you can adjust your departure and arrival cities as well as your desired dates of travel. You could use also: SkyScanner, Momondo, CheapTickets or Kiwi to book the flights. Please note: Prices and availability may change very fast. Simultaneously the geographic, cultural and political heart of Thailand, Bangkok bustles with enthralling nightlife, charms with enchanting histories, and sooths with its blooming relaxation industry. Therefore, the world explorer may find that travel to Bangkok is an all-encompassing experience of modern Southeast Asia’s many diverse offerings. 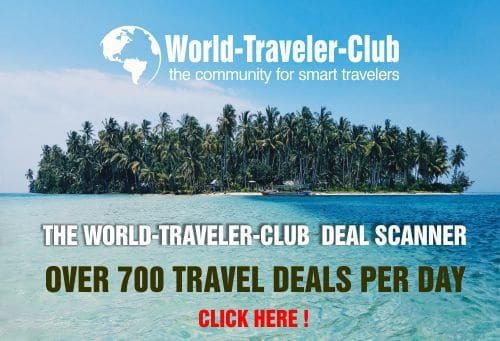 And luckily, finding airfare to Bangkok right here on World-Traveler-Club is not nearly as mysterious as navigating the charming but winding streets and canals of the city itself. Bangkok is officially known as Krung Thep, “City of Angels” in Thai, and Bangkok is actually only a small district that is home to the original village situated along the Chao Phraya River. The Bangkok of today certainly offers a taste for every palate. The infamous nightlife is overactive while the temples, museums and walking tours are abundant. Wow!! In BUSINESS CLASS to Bangkok (Thailand) for only €822 (round-trip).